A couple of years ago, wonky bloggers started really digging into new releases of economic data. When GDP numbers were released, you could find a dozen posts diving deep into the weeds and explaining why the numbers did or didn’t really matter: defense spending was artificially up, inventory gains were wacky, the timber industry had an unusually good quarter, etc. etc. Then that got tiresome, as everyone realized that there are details like that every quarter. Most of the time, the headline number is pretty much the best indication we have of how the economy is doing. Now we’ve entered a third phase, in which the fashionable thing is to discount even the headline number because it’s just going to get revised next quarter anyway. So who knows? I have a feeling that people who are new to economic analysis go through these phases routinely, while the wise old hands nod along and wait for them to pass. Now a new generation has done this, and a few years from now we’ll all be nodding along with a smile when a fresh batch of kids comes along and discovers that GDP reports and employment reports come with loads of detail to analyze and are always revised once or twice before they settle down. 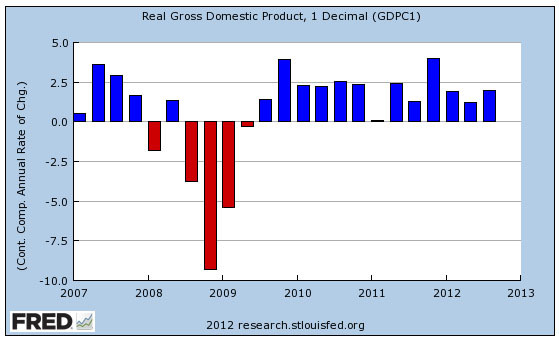 In the meantime, GDP grew 2% last quarter. That’s not terrible, but not great. We need to do considerably better if we want to get unemployment down to acceptable levels. And like it or not, that’s about as much as we know: the economy isn’t terrible and isn’t great. It would be nice to know more, but we don’t.